While driving north on Boulevard toward its intersection with Ponce de Leon Avenue, you might pass Derr Robinson Steadman in a lawn chair holding a sign that says, "You are reading this now," or, "Mattering does not even care." Stalled motorists comprise the majority of the artist's audience. Their chuckles are his only compensation. When not entertaining traffic, he sits away from the road drawing trippy postcards that portray awkward conversations at bus stops or cynical book covers like How to Shove Yourself Up Yourself, Volume Eat Me. Many of the postcards end up stuffed in a beach bag, but some of them make it to Derr's pen pal of 11 years, Ivette Spradlin, whom he affectionately calls Evie. Derr and Ivette met at the Local in the early 2000s through her brother, who happened to be Derr's co-worker at the Rolling Frame Revue, a custom framing shop that has employed Derr off and on since 1978 and sells some of his pieces. That night at the dive bar, Derr drew Ivette's portrait and gave her a postcard of a flying George Washington wearing a green watercolor cape; the president's face was a George Washington stamp Derr had affixed to the paper. Ivette immediately appreciated Derr's humor and sense of composition and design. "The humor comes out because of how he crops it and fills the frame," she says. "It's playful and kind of cartoony, but there's also a smart, dark side to it." After his one-year, 10-month, 25-day stint in the Army, Derr secured a job with Eastern Air Lines in Hartford, Connecticut, but the company fired him in 1975. 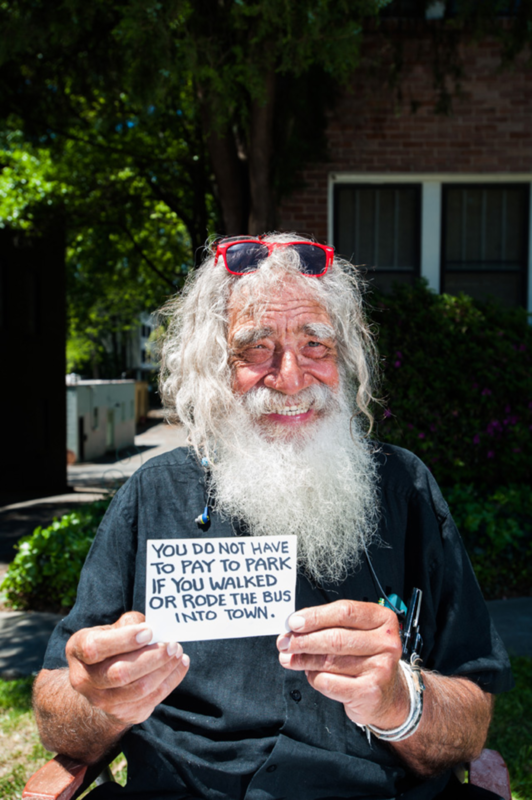 While hitchhiking back to Atlanta, he started creating his postcards. "I couldn't carry anything bigger," he says, noting his artistic talent dates back to second grade. "When I was supposed to be developing my reading and math skills, I was taken out of class to paint sets for school plays. So I don't know words like 'incoherent' and such." Ivette moved to Pennsylvania in August 2005 to attend graduate school but asked Derr to be her pen pal before relocating. Derr mails her postcards in intermittent spurts, and Ivette, now an adjunct professor of photography at Carnegie Mellon University, sends Derr photographs in return. Ivette's favorite postcard portrays two feet on a blue and white tile floor along with the headline, "At least one way that tattoos can be functional as well as decorative." The tattoo on the left foot reads, "This is this one," and the tattoo on the right foot reads, "This is this one" — which encapsulates the absurd sense of humor she and Derr share. "When I was at [the University of Georgia], I made the boring drive on 316 to Atlanta a lot," Ivette says. "I had an idea for a performance piece where someone on the side of the road holds a sign that says 'Hey you,' and 10 minutes down the road, another person is holding a sign that says, 'No really. Hey you.'" Ivette brought a crowd of friends to Derr's show at the Eyedrum Art & Music Gallery in 2005 prior to her departure, and to this day she champions his drawings. Two years ago, she shot footage for Nothing Is All That I Yearn For, a feature-length documentary about Derr that would help promote and sell his work, and hopefully lead to another show at a local gallery. Because Ivette's professional and personal obligations have prevented the film's completion, she recently set up an Instagram profile to build a fanbase in the meantime. The Instagram profile consists of Derr's artwork, photographs of Derr, and clips from the documentary. Soon, Ivette and two collaborators will launch video interpretations of Derr's postcards on the account as well. As a result of the film and growing Instagram following, Derr has become more prolific in the past couple years. "As you age and don't have a partner — and you're also living in poverty plus with mental illness — it's hard to want to keep going," Ivette says. "I feel that my interest and care mean a lot to Derr." "What do we thrive on? Praise and all that," Derr says. "Evie got me to where I am today." Some of the postcards stored in Derr's beach bag are addressed to former classmates, or the recipient section remains blank. An overwhelming majority, though, were intended to be sent to Ivette's old addresses in Pittsburgh. Perhaps he should send them anyway and make strangers cackle. In Derr's world, laughter is currency.